Witch hazel is a plant native to North America and parts of Asia that has been used for centuries for its skin soothing properties. You’ve probably noticed witch hazel extract in the list of ingredients in many beauty and health products as its powerful antioxidant and astringent benefits are known to help speed healing, prevent signs of aging, stop cellular damage that can lead to skin cancer and eradicate bacteria that lives within the pores of the skin. Plants like witch hazel contain a high level of polyphenols; the same compounds used to create anti-aging supplements that help slow down disease. As it’s a natural anti-inflammatory and antioxidant, it’s able to battle free radicals to protect against DNA damage. Now that you know a little bit about witch hazel and how it works, here are some of the reasons you should start using it on your face and skin. Instead of picking at a zit and making the problem worse, if you apply witch hazel directly to the area of the skin when it first begins to form, it can halt progression in its tracks, helping it to heal before it becomes bigger. You might think that if witch hazel is good for treating acne and oily skin that using it on dry skin is a bad idea, but you’ll be surprised to find that it’s the opposite. It removes the stuff you don’t want, like excess oil and impurities, and then nourishes the skin with healthy moisturizing properties that prevent the skin from drying out. Although witch hazel does remove oils from your skin, it won’t dry it out like most store-bought astringents. When you use witch hazel right after a shower, it works to seal in moisture, which is wonderful, particularly if you tend to have dry skin in the winter months. Witch hazel can bring relief to a sunburn as healing damaged skin is one of its specialities. It will lessen healing time as well as prevent skin peeling and flaking. Treat a sunburn by spritzing witch hazel on the affected area, or applying a cotton pad soaked in witch hazel to soothe the inflamed skin. Instant relief! Whenever you’re feeling tired or stressed, you can use witch hazel to refresh yourself. Simply add witch hazel to a spray bottle and keep it handy. Spraying it on your face will feel invigorating, while also helping to remove excess dirt and oil and soothing the skin all at the same time. You can also use it for tired eyes (not by spraying witch hazel into them, of course) but by soaking a cloth in witch hazel and cold water and placing it over closed eyes for about 10 minutes. Afterward, any redness should be gone, and your eyes will feel refreshed and ready for tackling whatever you need to. Thayers Alcohol Free Witch Hazel is regarded as the best brand of witch hazel. You can purchase it from this page on Amazon. Learn all about the health benefits and alternative uses for witch hazel in 14 Reasons Why Witch Hazel Should Be In Every Home. 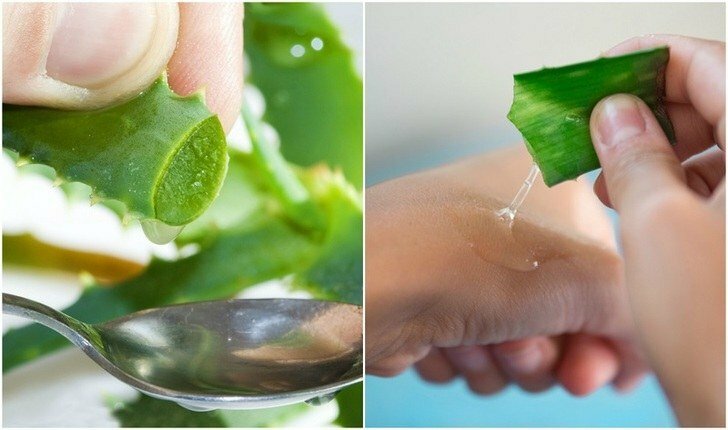 Also, be sure to check out this Homemade Green Tea & Aloe Skin Toner To Tighten Pores, Remove Excess Oil & More. Your skin will thank you! 17 Anti-Aging Oils For Beautiful Skin + Recipes!